It seems that hardly a week goes by without another pub closing somewhere across London. This is not a recent phenomena as significant numbers of pubs have been closing since the last war. Some were damaged and not rebuilt, some closed when local industries shut down, population changes have had a significant impact and others just disappeared during redevelopment. The whole area to the west of Tower Hill has been rebuilt a couple of times since the last war, so I turned to the 1895 Ordnance Survey map to locate the pub. The Tiger Tavern was on Tower Hill, also known as Tower Dock. 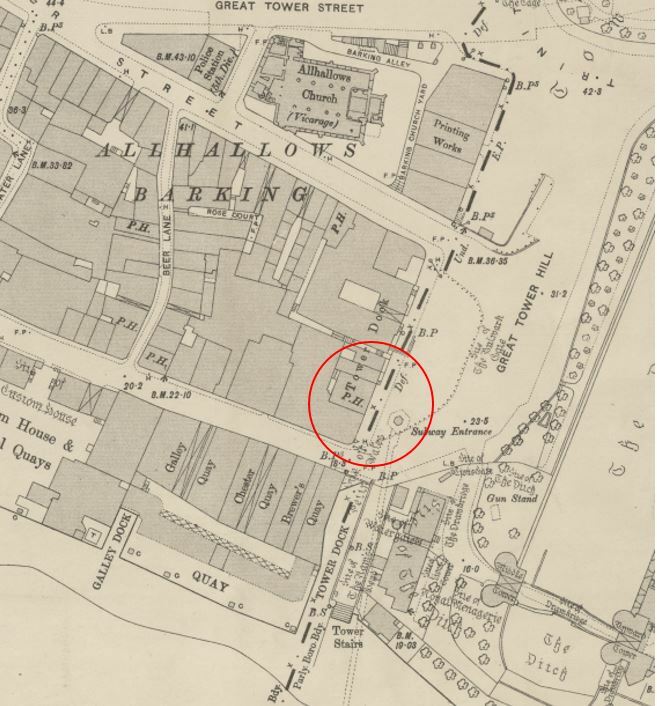 I have circled the location in the extract from the map below, the pub is marked P.H. As the whole area has been rebuilt, I needed a reference point and luckily there is one fixed point which has not changed in over 100 years, the entrance building to the subway, marked in the above map inside the circle with the wording Subway Entrance. 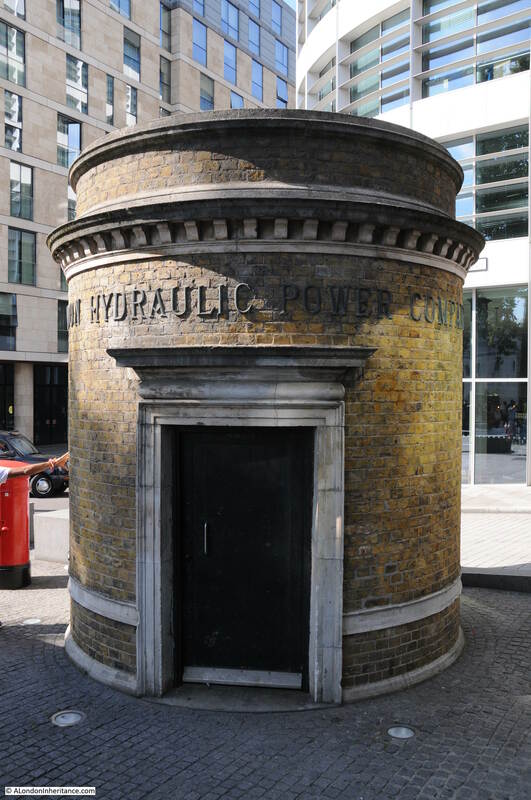 (the subway was originally a way to get across the river, but was not open for too long and has since been used to carry utilities under the river – this is somewhere I would really like to visit). The subway entrance building is opposite the southern boundary of the Tiger Tavern. The following photo is looking across to the location of the Tiger Tavern in 2016. The subway entrance building is just below and behind the tree on the far left. I could not get to the exact point where my father took the above photo as the visitor centre buildings are now on the spot. 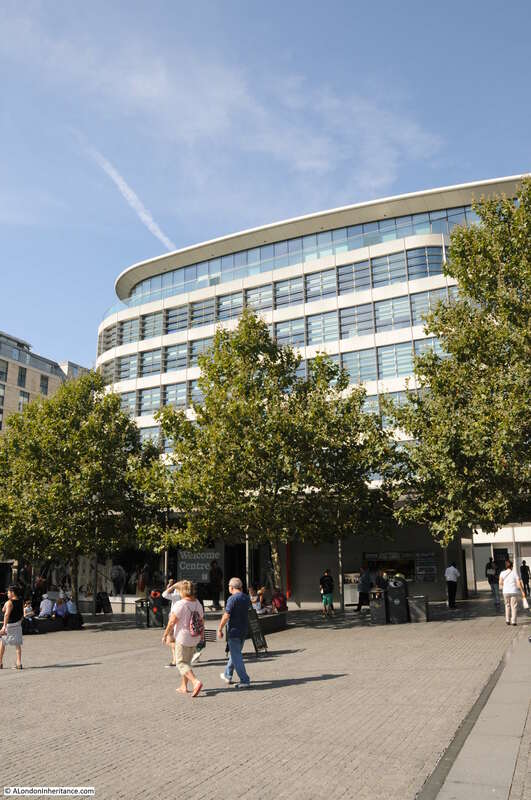 Behind the visitor centre buildings and this is the location of the Tiger Tavern, now the location of a Wagamama with floors of offices above. The entrance building to the subway – the only remaining reference point in this area. I could not find out that much about the Tiger Tavern. It appears to have been originally established around 1504 and over the centuries went through a number of changes and rebuilds with the building in my father’s photo being constructed in 1893. This building lasted untill 1965 when the whole area was redeveloped with a new office complex and a very different Tiger Tavern taking up part of the ground and upper floors. 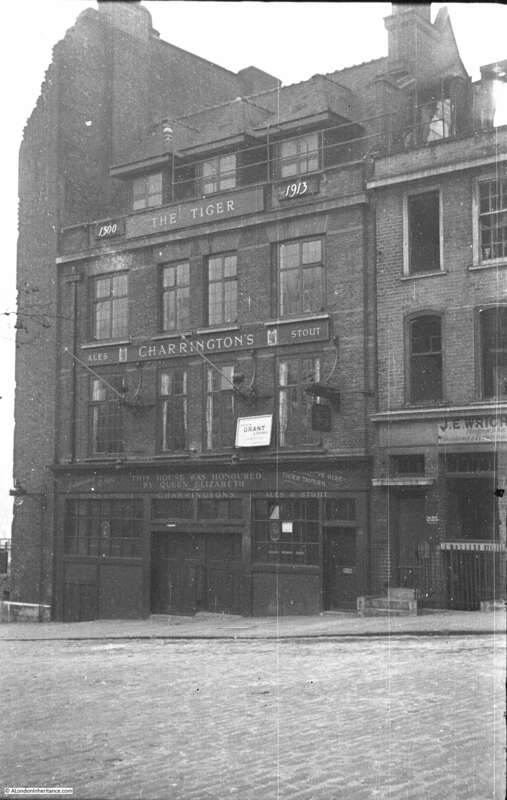 This last incarnation of the pub was demolished in 2002 along with the office buildings to make way for the latest office complex, although this development did not include a rebuild of the Tiger Tavern so after 500 years, Tower Hill is without a Tiger Tavern. According to The London Encyclopedia by Ben Weinreb and Christopher Hibbert, the Tiger Tavern had the mummified remains of a cat said to have been stroked by the young Princess Elizabeth when she was held a prisoner in the Tower. The entry on the Tiger Tavern also claims that there is still a tunnel from the Tavern to the Tower, although (writing in the 1983 edition when the 1965 version of the pub was in existence) this has now been blocked off. 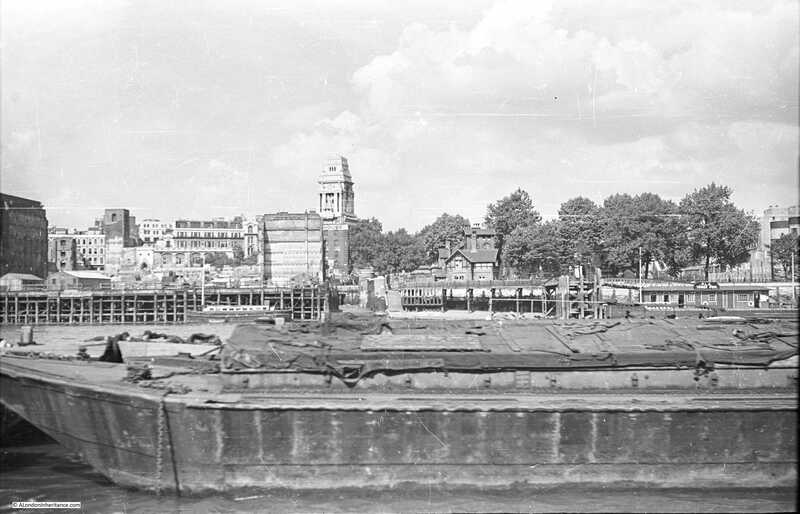 I have to admit I would be surprised if there was a tunnel as it would need to be deep enough to pass under the moat around the Tower, a not inconsiderable depth and distance to go from the Tiger Tavern into the Tower – but it would be fascinating to imagine that one did exist. I could not find any references as to the source of the pub’s name, although there was a Royal Menagerie at the Tower of London for many hundreds of years and tigers were part of this collection so perhaps this was the source of the name. “Before the Kingston-on-Thames County Bench on Monday, a man giving the name of Henry Henderson, 43, described as an agent of Long Ditton and New Malden was charged on a warrant with having obtained 2s by false pretences with intention to defraud Mr. Thos. Faier, of the Tiger Tavern, Tower Dock, London. The prisoner was undefended. Mr Faier stated that in June last he saw in several London newspapers an advertisement which represented that a woman named ‘A. Gage’ wanted a situation as ‘cook-general’ and which gave an address in Long Ditton. He wrote and requested ‘A. Gage’ to call upon him and in return he received a letter signed ‘H. Henderson’ which stated that if he sent 2s as an entrance fee ‘A. Gage’ would be sent to him. he sent 2s and on June 18th received another letter from Henderson stating that Gage had been instructed o call upon him. Gage, however, did not come, and two letters which he subsequently wrote to Henderson were ignored”. The article then goes on state that the police were called in and Detective Inspector Scott called at the address of Henderson and arrested him. He found a large pile of ashes in the back garden from burnt correspondence and also went to another house in New Malden used by Henderson where he found a large pile of letters from other people who had also sent 2s but had not received any visits from the advertised person. Henderson was receiving 60 complaints a month which gives an idea of how many people he had defrauded out of 2s. The article does not state whether A. Gage existed – I suspect not. “The Citizens of London one and all proclaim their defiance of the rigours and vexations of the times and their will to stand fast for the upholding of the might, the unity and the weal of this Realm – so ran the text of a cheerful invitation to attend to-day the hanging of a laurel and holly ale garland over the portal of the Olde Tiger Tavern on Tower Hill. The tavern’s hospitality according to the invitation would run on this day to the tasting of ‘wassail bowl, fettled porter, lamb’s wool and mulled ale (of the best)”. The article then goes on to describe the Lord Mayor raising the garland, and various drinks being served by waitresses in Elizabethan dress (this was in 1949 and I suspect the Tiger Tavern was now looking to the future and to trade more on the historical connections rather than just as a local pub. The addition of ‘Olde’ to the name and waitresses in Elizabethan dress point to this future). That is my Christmas drinks sorted ! There are many other accounts of ceremonies held at the Tiger Tavern, weddings, job adverts, barmaids being robbed, customer deaths etc. 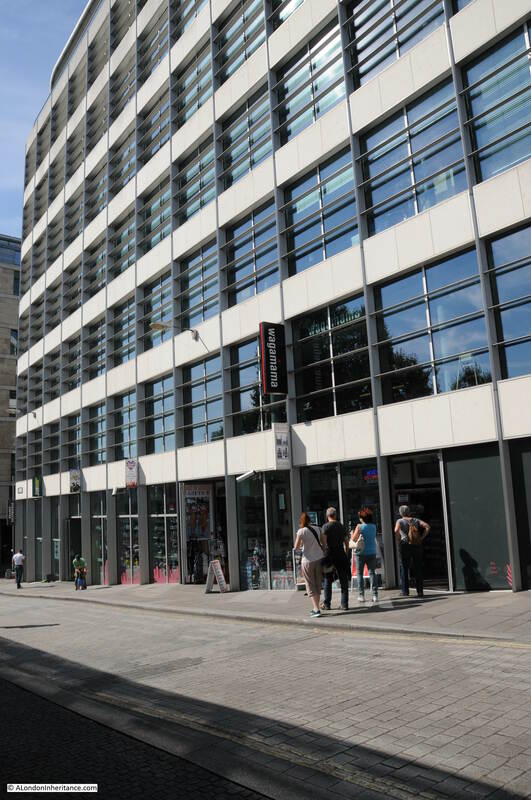 It was strange to think of this long and detailed history of Londoners at the Tiger Tavern standing outside what is now a rather bland office block and chain restaurant. The following photo helps fix the location of the Tiger Tavern. In my father’s photo above, the building to the left of the pub has been destroyed, this is the side wall that can be seen to the left of centre in the photo below. The Tiger Tavern survived the Great Fire of London and as can be seen in the above photo it was one of the few buildings in the block that survived the Blitz, but it could not survive the development of the area in the last 20 years. This entry was posted in London Pubs and tagged Tiger Tavern, Tower Hill, Tower of London on November 6, 2016 by admin.